The term water bird or waterbird is used to refer to birds that live on or around water. Some definitions apply the term especially to birds in freshwater habitats, though others make no distinction from birds that inhabit marine environments. In addition, some water birds are more terrestrial or aquatic than others, and their adaptations will vary depending on their environment. These adaptations include webbed feet, bills and legs adapted to feed in water, and the ability to dive from the surface or the air to catch prey in water. The term waterbird is also used in the context of conservation to refer to any birds that inhabit or depend on bodies of water or wetland areas. What a thrill to see this species!!! A sudden lunge of the head followed by wild neck and throat contortions captured our attention as we drove slowly through the refuge. 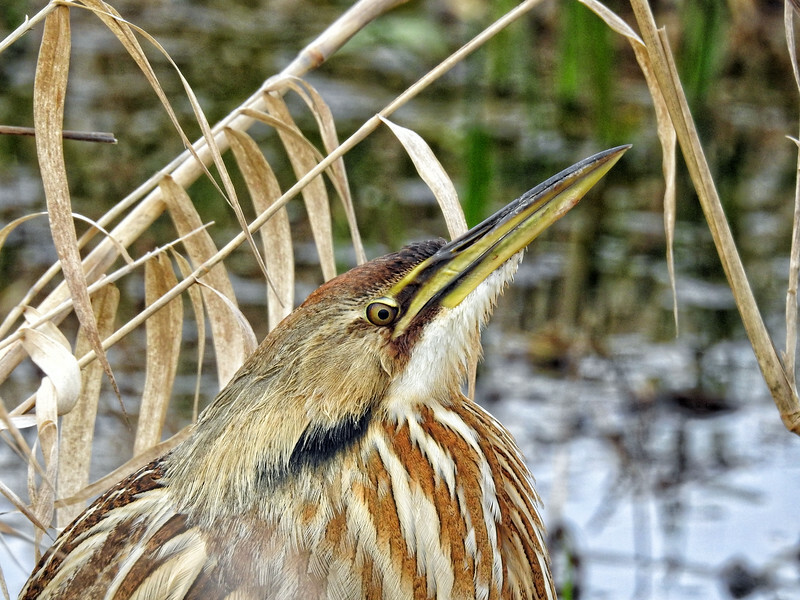 The bittern had just caught a bite to eat and was busy assisting the descent of the victim to an introduction to it's stomach. With it's coloring and tendency to move very slowly, if not for the movement the bird made it is doubtful we ever would have found it.